Explore using the GPS: Grad Portfolio Story process that assists college seniors in mapping their journey to life after graduation. This portfolio process is used in KSU 4401: Senior Seminar, an institutional elective capstone course, where students develop the life-long practice of archiving, reflecting, and sharing their stories, to honor, understand, and connect their learning from self to global society to enhance both. Answering the questions of why and how to use eportfolios, attendees will explore the GPS: Grad Portfolio Story process, which empowers college seniors, by assisting them in clearly mapping their journey to life after graduation. The GPS: Grad Portfolio Story process is used in the KSU 4401: Senior Seminar, which is an eportfolio-centric course assisting college seniors transitioning to post-university life. First, we will learn about the GPS: Grad Portfolio Story process, which includes the development of the mission, design, format, managing and sharing the portfolio. Second, we will receive resources ranging from eportfolio multimedia tutorials to student suggested eportfolio resources, for immediate implementation in their course/programs. Third, we will with have an opportunity to interact and share ideas and insights on assisting college seniors in mapping their journey to life after graduation using eportfolios. Let’s stay connected on social media. 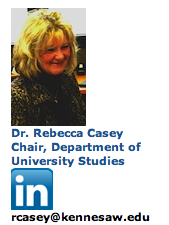 Dr. Rebecca Casey is an Associate Professor of English and Chair of University Studies at Kennesaw State University in Kennesaw Georgia, north of Atlanta. She holds a Ph.D. in Higher Education, Composition and Rhetoric from Georgia State University, with specializations in adult learning theory, computers and composition, on-line writing instruction, and history of Scottish Rhetoric. Her Masters and Bachelors degrees in English Education were conferred at Southern Illinois University. Dr. Casey has worked for over 15 years leading college transition programs. She directs an academic department at KSU which houses the honors programs, first-year experience program, the learning communities program, Sophomore-year and senior-year experience programs, and others. An administrator and leader in the newly established University College, Dr. Casey has 25 full-time tenure-track faculty and 5 full-time staff under her supervision in the department. 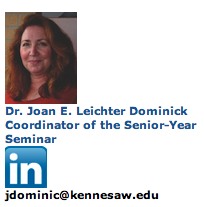 Dr. Joan E. Leichter Dominick is an Associate Professor of Communication and the KSU Senior-Year Seminar Course Coordinator at Kennesaw State Unversity. She is an award winning college educator with over a thirty year professional history in the disciplines of Adult Education and Communication. Dr. Joan E. Leichter Dominick holds a Doctorate in Adult Education from the University of Georgia (1990) and Masters Degree (1975) and Bachelors Degree (1973) in Communication Arts and Sciences from Queens College, City University of New York. Dr. Joan Leichter Dominick has served as the leader of this academic institutional elective capstone since 1998, having taught the first course in 1997. She designed the Senior-Year Seminar Course during her tenure in the Governor’s Teaching Fellowship Program 1996-1997, prepares seniors for their post-university experiences as productive national and global citizens. This seminar is based on a earlier academic version developed in 1990 by President Emeritus Betty Siegel, Kennesaw State University. Since joining Kennesaw State University in 1990, she has chaired the Communication Department, won the 1996 Distinguished Teaching and the 1996 Regent’s Distinguished Professor of Teaching and Learning at the Kennesaw State University. She has also taught First-Year Experience Seminars & First-Year Learning Communities. Thanks to the following Kennesaw State University Graduates and former KSU 4401: Senior Seminar Students for being part of the video “Mapping Your Journey to Life After College: GPS Grad Portfolio Stories” 2014 multimedia video: Neha Ali, Emily Rowland Wells, Sean Crampton, and Bethanie Izar. Your testimony is an academic gift to the future students creating their GPS: Grad Portfolio Stories. Thanks to Jennifer Leifheit-Little, UITS Production Coordinator and Veronica Trammel, Director of UITS, for supporting the design and development of the Mapping the Journey to Life After College: Using Your GPS Grad Portfolio Stories Multimedia Project, Fall 2014. Thanks to Ben Cope, Internet Genius Consulting, LLC and CFA Team, and WordPress Expert for designing and developing this website Degreeconomics.com and all my Websites.